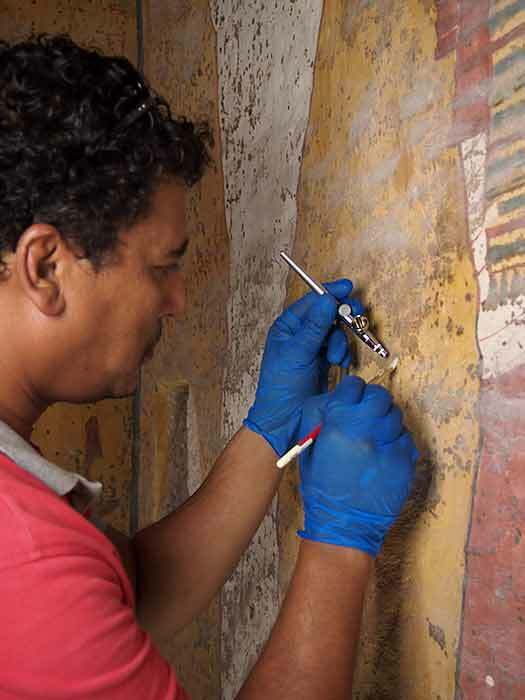 Research and investigation during the project's first phase led to the development of a conservation program for the tomb and its wall paintings, jointly agreed upon by the SCA and GCI. It identifies the principal problems requiring intervention, characterizes their nature and extent, and defines recommendations for treatment based on investigation, testing, and in situ trials. Based on investigations, the condition of the paintings is excellent. The paintings have been extensively treated over the years, which is evident from the many grout holes, adhesive drips, and plaster repairs visible throughout the burial chamber. Therefore, necessary remedial treatments are limited in scope. The principal conditions still requiring treatment include localized lifting of paint flakes and thin plaster washes and loose and fragmented areas of plaster. In addition to these conditions, there is also widespread dust deposition as well as non-original surface coatings and drips from previous treatments. Each of these conditions and the parameters for their treatment are described in the conservation plan for the tomb. In the wider context this plan provides a model of conservation planning and implementation by addressing a number of other issues, such as the promotion of modern principles and standards of conservation practice (minimal intervention, compatibility of materials selected, etc. ); appropriate diagnosis of deterioration and its risks; selection of appropriate conservation materials through a program of testing and development that stresses assessment of performance criteria and working properties; exercising restraint in cleaning and evaluation of results; and demonstrating the importance of placing treatment within a context of other conservation measures (environmental monitoring and control, dust control, long-term condition monitoring) and training of local SCA conservators.